Eye health and effective vision are very important to your pets' quality of life. During regular checkups, your primary care veterinarian will monitor your pets' eye health, as part of a general assessment. If your pet has a minor ocular condition or injury requiring treatment, in many cases your veterinarian will be handling it. For more complex cases, however, you may be referred to or seek assistance of a board certified veterinary ophthalmologist who has specialized training, experience and equipment. 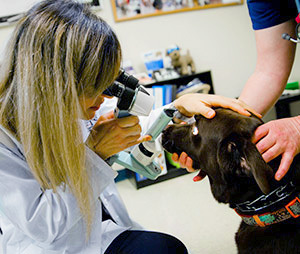 Veterinary ophthalmologists are veterinarians who undergo three to four years of training in an approved residency program, and specialize exclusively on medical and surgical treatment of the animal eye. The Ophthalmology Service at Tufts VETS offers the most advanced diagnostic and treatment practices for eye diseases and injuries in small animals and exotics. We provide clear and complete explanations of the problem and the appropriate treatment for both you and your veterinarian. We strive to deliver optimum medical care which will provide the best possible outcome for your pet. We perform cataract surgery through phacoemulsification and IOL (artificial Intra-Ocular Lens) implantation. We insert foldable IOLs that provide your pet with the least invasive and inflammatory procedure available today. This type of surgery is the same as the surgery performed in people, the outcome of which is reported to be the most successful. Anterior vitrectomy is also available if the pet requires it. Lens instability is a severe concern in specific breeds, such as Terriers and Terrier crosses, which are predisposed to its development. Anterior lens luxation is considered a surgical emergency and requires immediate attention. According to the specific case, intracapsular lens removal or manual repositioning may be recommended. This sophisticated piece of equipment allows the newest, most advanced surgical treatment for glaucoma. We are currently among the few practices in New England to offer this procedure, which controls and treats glaucoma. Presurgical evaluation and clinical assessment will be required. A small goniodevice (silicone valve) may be also implanted according to the specific case. *** Please note that a complete physical exam and blood testing are required before surgery. Diagnosing and treating eye disorders can involve both simple and more advanced methods. Tufts VETS offers you and your veterinarian a full range of diagnostic and surgical services. The initial diagnostics that are done on almost all veterinary patients will include a Schirmer Tear Test, intraocular pressure assessment, pupillary dilation, and corneal staining. A Schirmer Tear Test measures the eye’s tear production. Veterinarians will perform this test anytime the eye is red and has discharge. The test is performed by taking a tear test strip and placing the end between the lower eyelid and eye. The amount of moisture wicking up the strip in a minute is measured. Normal values vary between species but for the dog 20 mm +/- 5 mm in 1 minute is considered normal. A biomicroscope, a specialized piece of equipment provided with focal light source and magnification is then used to examine the eyelids, structures surrounding the eye, and front half of the eye. The Pupillary Light Reflex(PLR) is determined for both eyes. Once the external and anterior portions of the eye have been examined, the cornea is often stained with fluorescein dye. The dye will adhere to corneal structures if there is a break in the cornea’s epithelial surface and indicating an ulcer is present. Intraocular pressure (IOP) is measured with a tonometer. An elevated IOP may indicate glaucoma. One of the first signs of glaucoma may be redness and discharge so measuring IOP is an important diagnostic test to prevent elevated IOP from blinding an eye. Once intraocular pressures are determined to be within normal limits the pupils are dilated. Typically, dilation will take 10 to 20 minutes to complete, with pupils remaining dilated for about two hours. A variety of ophthalmoscopes may be used to examine the back or fundus of the eye (retina, choroid and optic nerve). When examining the fundus, the specialist will be looking at the number and character of blood vessels, size and shape of the optic nerve, pigmentation or depigmentation, retinal anatomy, and intensity of tapetal reflectivity (the tapetum is the part of the back of the animal’s eye that reflects light back out of the eye).